Moving to a new neighborhood can be hard. You have to learn the layout of the local grocery store, find a pharmacy and your go-to pizza place — not to mention adapting to a new community culture and way of doing things. When nearly 200 Cornell Tech students moved to the Roosevelt Island in August, they faced all these same challenges. A handful of them dived into the Roosevelt Island community head first in a pilot of a new service-learning course entitled “Remaking the City” taught by Associate Professor Tapan Parikh. Over the course of the semester, student teams were paired with Roosevelt Island organizations like the Senior Center or the Roosevelt Island Operating Corporation (RIOC) to complete two projects: (1) a service learning project; (2) a design thinking challenge. Groups worked with the organizations to understand their needs and challenges and develop technological and design solutions for them. “In our class, the organizations we work with are small (often very small, including being completely volunteer-driven), but deliver essential social, cultural, environmental and economic services to the community,” Parikh said in a blog post at the beginning of the semester. Traditionally, technological solutions are often difficult to adopt for these organizations. “The goal of this course was to explore technological challenges relevant to small voluntary and civic organizations, as well as to help students build relationships with Roosevelt Island’s diverse people, places and organizations,” Parikh said. Next, students worked on their design thinking challenge projects which culminated in presentations to community members, press and the Cornell Tech community. Awards of $1000 and $500 to continue working on their project were up for grabs for the ten teams. The judges charged with giving out the awards included Cornell Tech Community and Construction Task Force member Jonathan Kalkin, Roosevelt Island Operating Corporation board members Margie Smith and Howard Polivy and Cornell Tech’s Senior Director of K-12 Education Diane Levitt. Projects included a dock-free bike sharing program, an app to help users organize community building events, a local currency, and a co-working space on Main Street. 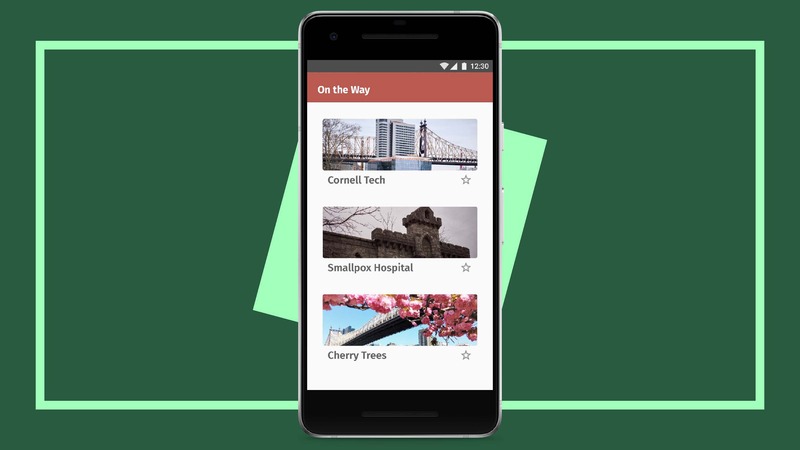 Ultimately, the grand prize went to Flourish, a mobile-optimized website to help Island visitors and residents discover and take advantage of the many green spaces throughout Roosevelt Island. The team was made up of Arpit Sheth, Master of Computer Science ‘18, Rainie Sun, Technion-Cornell Dual Master’s Degrees in Connective Media ‘19, and Shanshan Zhang, Connective Media ‘18. After exploring the Island green spaces, the team began working on a custom Google Map. A mockup of the Flourish app. Let’s Eat RI!, a local food festival, and Intergenerational Moth, a live storytelling collective, tied for the second place prize of $500. Students relished the opportunity to engage with the local community. As Cornell Tech continues to settle in to our new home on Roosevelt Island, this course was a practice in community building as well as a way to create sustainable partnerships with many island organizations.